When Jim started collecting Pez, it was a pretty casual thing – until he became connected with the Pez community through Facebook. It was at that time his collection exploded and he got really involved. ​I had NO idea there were that many other collectors, especially enough to justify multiple conventions. I was never against it but, to me, it was crazy. Jim got really passionate about buying/selling/trading and was able to do enough to support his own habit, so I just kind of stayed out of it and let him do his own thing. He invited me to join him at multiple events, but I just wasn’t interested and didn’t want to take the time off from work or spend the money to go. One day, Jim told me that he wanted to host a convention in Michigan. I just kind of shrugged my shoulders and told him to go ahead. He had supported his own habit this far, I was sure he could support the efforts involved with something like this. In February, Jim decided to get some folks together for dinner to talk about the convention and get some feedback about their thoughts. Truth be told, I was looking forward to a quiet night at home while he was out with his friends. It caught me completely by surprise when he asked me to be there. For the record, I wasn’t against meeting Jim’s Pez friends. It was really more about feeling like I spend all of my days running around and the thought of having to run around to one more thing wasn’t my favorite idea. But, I knew it was important to Jim, so I went. There was a small handful of people who made it to the dinner – Steve and Christine Kois, Eric and Mary Petro, Tom and Heather Johnson, Chris and Mary Wiley, Lynn Mier, and Shannon Considine. There was a lot of talk and excitement about the idea of a Michigan convention. Jim made special Pez dispensers to commemorate the event and even auctioned some items to get some funding going. At this point, I still had never been to a convention and had no idea what was truly happening, but I did know that I thought all these Pez people were pretty nice folks and was happy to have met them. Its not always in my comfort zone to meet new people, but everyone was so genuine and friendly that they made it very easy. After the dinner, Jim started planning. And designing. And talking with people. And ordering stuff. And lots of times, he would ask for my opinions, which was HILARIOUS because I had NO idea what these Pez conventions were all about. There were quite a few times Jim had some awesome ideas that I gave him some really encouraging feedback about. There were other times I told Jim an idea was the worst thing I had ever heard. There were a lot of times I told him to call Heather because she would know better than I would. In the end, though, I pretty much stayed out of things and Jim did quite a bit of the work with a lot of help, support, and encouragement from some amazing people. Then, Jim asked me if I would attend his convention. I had originally intended on showing up for each day but coming home to sleep in my own bed and take care of our dogs. Jim was asking me to really attend. Like 24/7 commit and board our dogs at the vet attend. Still having no clue, I agreed. For the better part of the summer, there was at least one table set up in front of the couch in my living room while Jim worked on building dispensers, candy packs, registration packets, and a million other things. He got up early and stayed up late making sure that every detail he could think of was addressed. As August drew near, our house started to get pretty messy. There was stuff everywhere, including three rolling carts full of stuff being stored in our dining room. It was really starting to drive me crazy and stress me out. I did my best to be understanding and patient, but I’m pretty sure I wasn’t. On Thursday, I left work and drove an hour to the hotel. When I arrived at the room, there was stuff EVERYWHERE. The front part of our room was set up for registration and merchandise purchases and Jim and his parents were serving as the welcoming committee. Right away, I met Jean Dougherty and Sharilyn Rae, who were both so super nice. Shari immediately asked me to sign her bucket. It kind of caught me off guard because I don’t know why she would want me to sign her bucket – I am not really a Pez person, so my signature doesn’t count! I signed Shari’s bucket and then made it my very next order of business to head down to the bar for my complimentary drinks before I ran out of time. I noticed the convention banner hanging from the bar into the lobby as I walked up. I remembered helping Jim work through some of the design on the banner and, now that I saw it “in action,” I started to understand why he felt like it was important to have. It looked great and it was in the perfect location. The hotel offered free snacks and three complimentary drinks to overnight guests from 5:30-7:30 every evening. In addition to the usual offerings, there were three signature drinks available for purchase in custom convention pint glasses. There were tables and a few people hanging around. I introduced myself to Frank and Sue Mountford, and apologized for not joining them for dinner with Jim the night before. They were so nice and friendly and anyone who knows Frank knows that carrying a conversation with him is easy. They were accompanied by Carol Wright Kinard, who told me she had a gift for me. Totally scary. Jim likes to joke around with people and I had no idea what kind of relationship he and Carol had, so I could only imagine what kind of gift she would want to give me. And as the wife of the host, I had to be on my best behavior, so yay for me, lol. I moved on to the next table and talked with Jean and Shari for a little bit. I had heard so much about Jean over the past year that it was nice to put a name with a face. And Shari is a total riot! I was trying to make my way around the room a little more (mingling is NOT my strong suit) and Jim showed up with the Wheel O’ Fun for everyone to spin and win tickets. Tom “The Wallet” Johnson spun a solid 16, and Heather followed suit. Solid start for Team Johnson. Our friend Terry showed up and played some music and sang for a few hours. He was wonderful, but it felt like everyone was more engaged in reuniting with friends than in listening to music. Terry’s biggest fan in attendance was actually Miss Patti, the bartender! It was super cute catching her boogying behind the bar. Friday morning had an early start, with an awesome breakfast and then moving all of the registration stuff down to our event room. I got lucky on this one because Jim and his dad were early risers and did most of the work on that part. The room had registration materials, the Wheel O’ Fun, convention merchandise for sale, the $2 box game, and the silent auction items. We also had cookies baked with love from Carol Wright Kinard and free Pez shoe samples from Chris Jordan. I liked working the registration table because I got to meet everyone that showed up, but there was SO much to share, I felt like I was rambling on and on with information overload. Oh yeah, and before I forget to mention it, the convention dispensers were pretty cool. Everyone seemed to be really excited and liked the magnetic feature. It was nice to be able to offer something different from all the awesome ideas at other conventions. My mom and brother showed up with our son, L.J. in the morning so he could participate in the activities. They stayed the entire day and were so much help! Friday morning, there was a pool party and chalk drawing contest. I spent maybe 10 minutes at the pool while Jim’s mom changed into her swimsuit so she could go swimming with L.J., but it looked like there was a good turnout of families and they all seemed to be having fun. After that was the chalk art contest. I didn’t see it myself, but it sounded like there was good participation and that everyone enjoyed it. At 3pm, there was button making. We had really good participation with that and Jim’s dad did a great job letting the kids help make their buttons. Everyone really seemed to enjoy that activity and we had some pretty creative folks! At some point in the day, I took my brother around to do some room hopping. He has collected Pez for a while, but has always been a pretty casual collector. He was excited to have found some really nice pieces. Then, I took my mom to Shannon’s room and tried on some of her fabulous LuLaRoe. I needed a dress for a wedding shower on Sunday and she had something that fit the bill and was super cute. It’s the first time I’ve ever bought clothes out of a hotel room! Friday evening, we played Plinko for tickets and had a bean bag tournament. I am NOT a bag player, so as much as I tried to opt out, I ended up having to play and recruit my mom as a partner to make up a team. My mom and I were paired up against Tim Dunn and Jean Dougherty. My first beanbag hit Jean in the leg. I was so embarrassed to have hit Jean, I didn’t even see the bag go into the hole! Thankfully, Jean was ok and such a good sport. She and Tim went on to become “Almost Champions” right behind Randy Puderbaugh and Mark Kolbusz. Saturday was another early morning and the big day. Dealers were setting up their tables, we set up our merchandise and admission table outside along with the free Pez dispensers sponsored by Realtor Krissy Jessop, folks came by from Joe’s Crab Shack with a game for the kids and free appetizer cards, and Mark Davis came by to represent our charity, Camp Lake Louise. For a first year convention, we had an amazing turnout. We estimate about 90 paying adults came through the door. Dave from Doc Sweets candy shop came by. In addition to supporting the convention by sponsoring all of the lanyards that were used for attendee badges and event swag, he brought his Candy Van to park outside the hotel. The Candy Van is pretty sweet, sporting an A-Team theme on one side and a Mystery Machine theme on the other. Dave also brought a banner to hang from the bar railing alongside Jim’s. We had some other attendees to note as well – Rick Marlowe dropped by from Ohio, and another man came all the way from Milwaukee! There were countless others who had traveled quite a distance. I was continually shocked by folks coming from all over the place to our event. I mean, people only travel like that for something they truly care about, so this must have meant something to all of them. People were wearing their Pez items, excited over the convention merchandise, loving free Pez at the door, and walking out with bags and totes of items purchased from inside the show. The time for the event just flew by. Afterward, we packed up everything and took it to our room and had a bite to eat to hold us over until the VIP dinner. While we ate, we talked with Mark about the camp and crunched some numbers to come up with some kind of goal for the auction. Through the camp’s scholarship program, it costs about $50 for each child sent to camp. There are about 12 spots available each week and the season is 10 weeks long. We did the math and realized that if we raised $6000, we could sponsor an entire summer of scholarships. Being our first year and not knowing what to expect, we decided that raising $2000-$2500 would be a great amount and made that our goal. The VIP dinner had some wrinkles to work out regarding food service. My food tasted excellent, but the service was reaaaaalllllly slow. Thank goodness we had other events to distract us. First, there was a raffle of vintage Pez donated by Chris Jordan. Three lucky winners received a Sheik, Maharaja, and a Captain Hook. Then, Chris and Mary Wiley were named as the hosts of future VIP Dinners and went on to announce the first Michigan Pez Convention VIP Dinner Honoree Heather Johnson. The Pez community had come together to show Heather their appreciation for all that she does for others and surprised her with gifts and special party hat Egg Baby dispensers to share with everyone in attendance. Before we knew it, it was go time. Time for the big event. Time to raise some money and send some kids to camp. We headed down to the ballroom and let people choose auction numbers and sold raffle tickets for a gift package featuring a bucket of Pez goodies, a display case provided by Display Cases, and the ultra-rare blue convention dispenser, later won by Lanie Zellmer. Jim opened with some recognition awards for Chris and Mary Wiley, Tom and Heather Johnson, Frank Mountford, and his parents for their immeasurable support during all of the planning, decision-making, and hard work both for and at the event. Jim then passed out nomination slips for someone to be named Grand Marshall of the event, later announced as Frank Mountford. 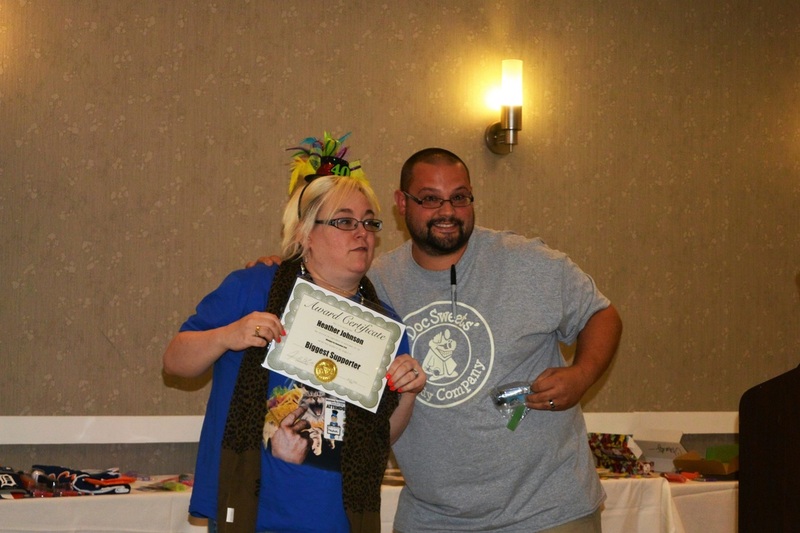 After recognitions, winners were announced for the Chalk Drawing Contest (Lacey Ash and Xavier Camden), Bead Contest (Tom “The Wallet” Johnson), Photo Booth (Eric Petro, Chris Jordan, and Ruth Ream), Best Bucket (Karen Pachowicz), and Best Button (Kelly Jo Mitchell). All of these winners also received certificates and prize Pez. Next, the Almost and Actual Bean Bag Champions were awarded certificates and specially made prize Pez. Then, the auction started. Jim did a great job facilitating with help from Frank Mountford serving as his Vanna White. The group was really engaged and participating and we were raising some great money for charity. By the time we got to the final two items, we had already surpassed our goal. The final two items raised some serious moolah – a White House Display Case purchased by Jennie Puderbaugh for $400 and the one-of-a-kind custom logo growler donated by Beer City Glass was purchased by Bob Bernacki over the phone for a whopping $500! 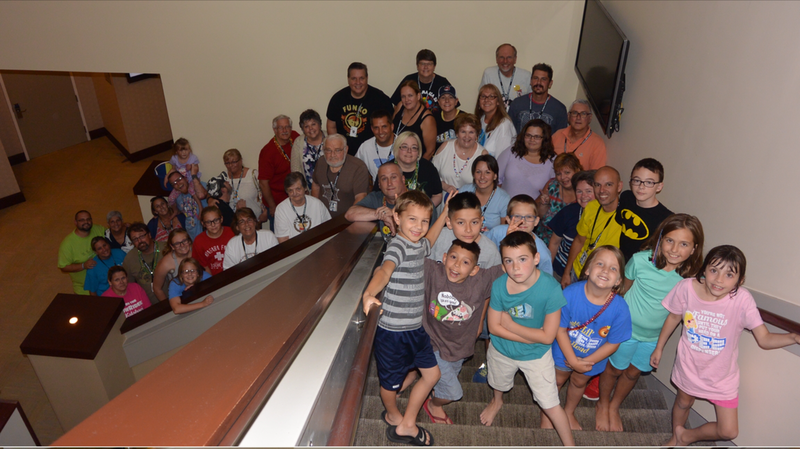 It was such an overwhelming and humbling feeling to know at the end of the auction that everyone who had purchased a charity dispenser, bought raffle tickets, and bid on silent and live auction items helped the Michigan Pez Convention sponsor nearly an ENTIRE SUMMER of camp scholarships. After the auction, we got everything picked up and helped Mark out to his car before a very long drive home. He was so touched by everyone’s generosity and couldn’t express enough how much this will mean for Camp Lake Louise. Afterward, we sat in Frank and Sue’s room with Tom and Heather Johnson and recapped the weekend, talking over what went well, what needed some work, and some preliminary brainstorming for 2017. Because, yes, we all knew there would be a 2017. I still don’t really get it, but I’m in. The way people were thanking Jim for hosting this event and continuing to shout their support in favor of a year two for the Michigan Pez Convention, I know this is a big deal and really important to quite a few people. And now, its just as important to a bunch of kids who need someone to show them God loves them. Will I ever collect Pez dispensers? I don’t know that I will ever consider myself a collector, but I will say that I am excited to play a more supportive role for the 2017 Michigan Pez Convention and help Jim and team grow this event and continue building relationships with one of the most genuine, welcoming, and generous groups of people I have ever met.